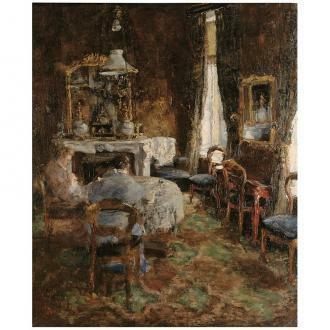 During the years 1878-1885 the young James Ensor emerged as the painter of the bourgeois, 19th-century interior with its typically private atmosphere. The figures who populate his interiors determine the highly suggestive climate in which, on the one hand is calm and intimate, yet on the other hand is busy, tormented and the fascination for light comes in play, such as in Russian Music (1881, oil on canvas, Royal Museum of Fine Arts of Belgium), The Bourgeois Salon (1881), Afternoon at Ostend (1881) and The Oyster-eater (1882). Ensor‘s interior paintings are in the tradition of Belgian artists Henri De Braekeleer, Constant Cape and Alfred Stevens. However, Ensor did not have an eye for the anecdote, but choose instead for a cursory, total impression of the space. At later dates, Ensor added masks, skeletons or 'Chinoiseries‘ to a few intimate interior paintings such as in Skeleton Looking at Chinoiseries (1885 and 1888).